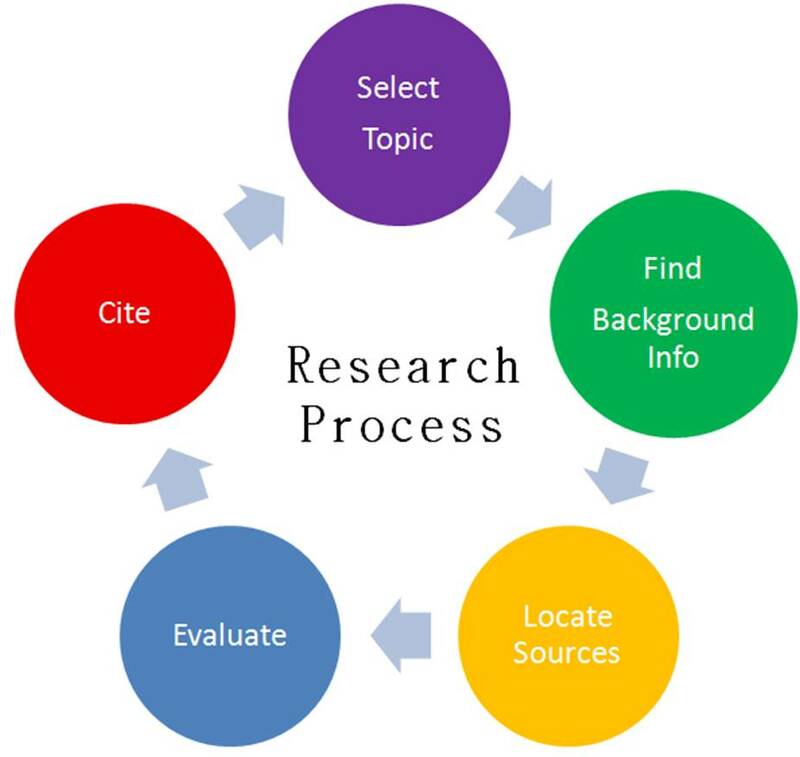 As a college student, you will be asked to write research papers for your classes. Having a thoughtful plan of action, known as a research process, will help you to systematically direct your efforts to find quality resources. Without a plan, it is easy to lose focus and become frustrated. Use the steps in this guide to help you become an efficient and effective researcher. Sometimes the general topic will be assigned by your professor; otherwise, you will have to select this topic based on the subject matter of the class. Browse through your course textbook for ideas. Acquire a general understanding of your topic. Use the reference section or the library reference databases, like Gale Virtual Reference Library, to find background information on your topic. Encyclopedias will be very useful for this purpose. General topics are usually very broad. Since most research papers that you will write are less than 15 pages, you will need to narrow your topic down by seeking a focus; otherwise, your paper could go on forever. Creating a question that you can answer is a good way to focus your topic. For example, if your general topic is family support as a pathway to success, you could make your focus about the impact of the changing nature of the family on academic success. Normally, you will be able to focus your topic based on the background information you have already conducted. Developing your focused topic into a research question will help you explore your topic without bias. Consider this research question: “How do the trends in family structure in the United States (more single parent households, for example) impact success among college students?” This question will allow you to look at all aspects of this topic. Conversely, a statement such as “Students from single-parent households have more obstacles in completing college” would limit your exploration and make your understanding of this topic relatively one-sided. Key terms are used to search and retrieve relevant resources from the library’s academic databases. Your key terms need to be specific, simple and represent your topic. For the example above, the key terms could be “academic success,” “academic achievement,” “educational attainment,” "single parent households" "children of single mothers." Be sure to consider all of the synonyms for your terms as this will affect the relevancy and variety of your results. Now that you have a focused research question, you will need to find published books and journal articles on your focused topic. To find more targeted, in depth sources, use your key words to search the library’s catalog and online academic databases. Be sure to evaluate each source for its credibility. Also, write down the bibliographic information of your sources as you conduct your research so that you can cite them at the end. Read the resources you have found and begin to organize your information. At this point, you should be refining your argument and developing your supporting points. Write your paper once you are confident that you have created a logical argument and can support it with credible research. Give credit where credit is due. You will need to cite the information from the sources that you used both within your paper and at the end of your paper (e.g. reference list). There are many different types of citation formats, so be sure to confirm with your professor which citation format is required.